The "Simple POP" is our original software that specializes in creating POP and in-store decorations. Such POP and in-store decorations can be designed through a simple operation using templates in the "Simple POP". Swing POP display, price cards, posters, banners, etc. Wall stickers, window signs, magnet sheets, tapestries, etc. Templates tailored for specific applications enable easy creation. 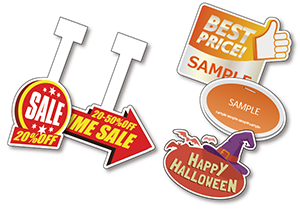 Print and cut data for POP and in-store decorations can be created easily. Automatic cutting improves work efficiency. Print on transparent, colored or metallic media is enabled by using white ink (with UCJV300 Series).